The UNO School of Music provides several ensembles in which students of all majors may participate. These ensembles are very diverse in instrumentation and type of music. 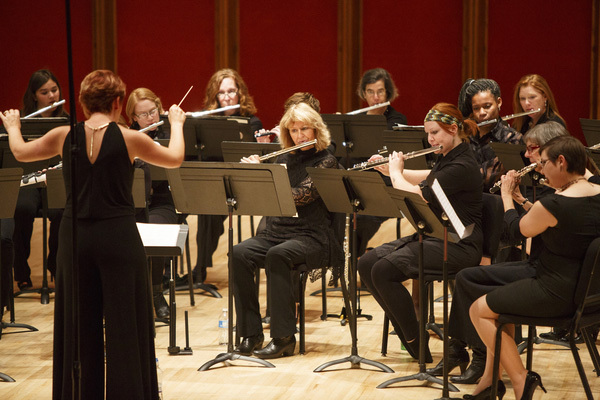 Since its inception, the Heartland Community Flute Choir (HCFC) has captivated audiences across the state with its enchanting sonorities and diverse repertoire which has included four world premiere performances of new arrangements and new commissions for flute choir. The HCFC gives an average of four local concerts in and around Omaha each year, and selected performances throughout the country. In 2011, the HCFC embarked upon their first European tour to Amsterdam, Belgium and France which included a personal tour of Eva Kingma’s flute workshop in the Netherlands, and concerts featuring piccoloist Peter Verhoyen in Belgium. You may find additional information about the Heartland Community Flute Choir by visiting us on Facebook or by contacting the director, Dr. Christine Beard, by email at cbeard@unomaha.edu. For more information about Woodwinds at UNO, please visit the Woodwind Area page. 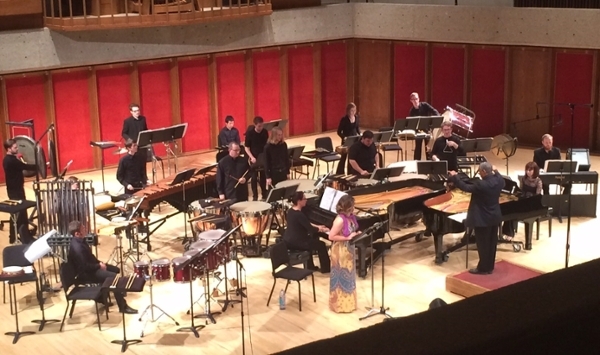 The UNO Percussion Ensemble performs a wide range of literature written (and arranged) exclusively for percussionists. The UNO Percussion Ensemble was founded in 2000 by Dr. Tomm Roland and has been recognized both regionally and nationally. In 2011 and in 2012, the ensemble was selected to perform at the prestigious Percussive Arts Society International Convention. It has performed at the Nebraska Music Educator’s Convention on multiple occasions and for the Nebraska Day of Percussion, the Iowa Day of Percussion, and the Concordia Day of Percussion. Students in the Percussion Ensemble have had the opportunity to tour throughout Nebraska as well as international tours to Japan and China. Literature for the ensembel spans many areas including classical percussion ensemble literature, western popular music, and non-western traditional music. The group primarily consists of percussion majors, but students majoring in areas other than music are encouraged to audition. For more information about joining the UNO Percussion Ensemble, please visit the Percussion Area webpage, contact us at unopercussion@gmail.com, or check out our Facebook page. Saxophone Quartet is a chamber ensemble committed to performing repertoire devoted to the saxophone. A broad range of music is studied while incorporating classical and jazz elements. The group performs throughout the year in various venues and is a regular participant in UNO's Sound Health program. 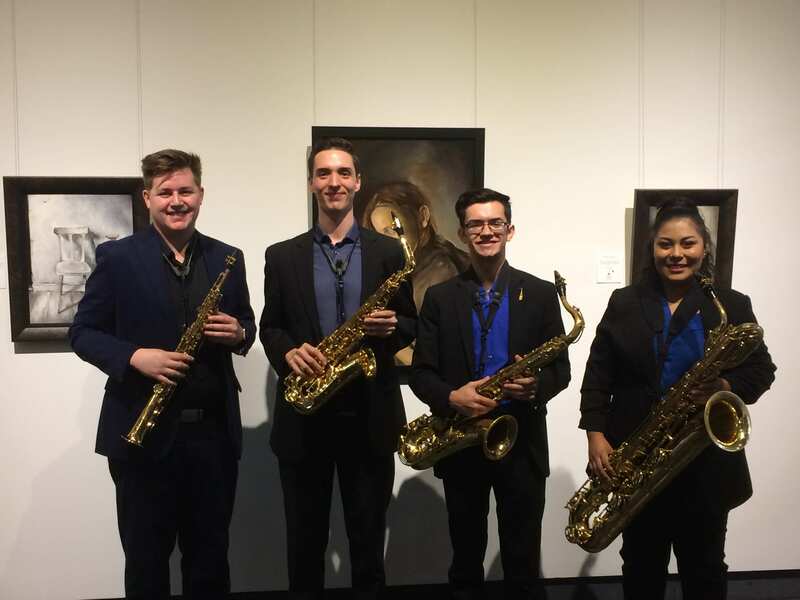 Through a nationally competitive audition process, the UNO Saxophone Quartet was recently invited to perform at the North American Saxophone Alliance Region 3 Conference. You may find additional information about the Saxophone Quartet by visiting by contacting the director, Dr. Patrick Brown, by email at patrickbrown@unomaha.edu. For more information about Woodwinds at UNO, please visit the Woodwind Area page.